An arrangement of a folk tune from Durham for Senior Orchestra by Ian Stephenson. As part of The Full English learning programme, Ian Stephenson worked closely with Edwin and Jessica Holmes in the Music Department at Durham Johnston Comprehensive School, Durham. Three pieces of music were commissioned for the school ensembles based on original manuscripts of traditional tunes and songs from the North East. The pieces had their debut at a folk themed school concert on 27 March 2014. The film of their performance can be watched from the video tab at the top of the panel. 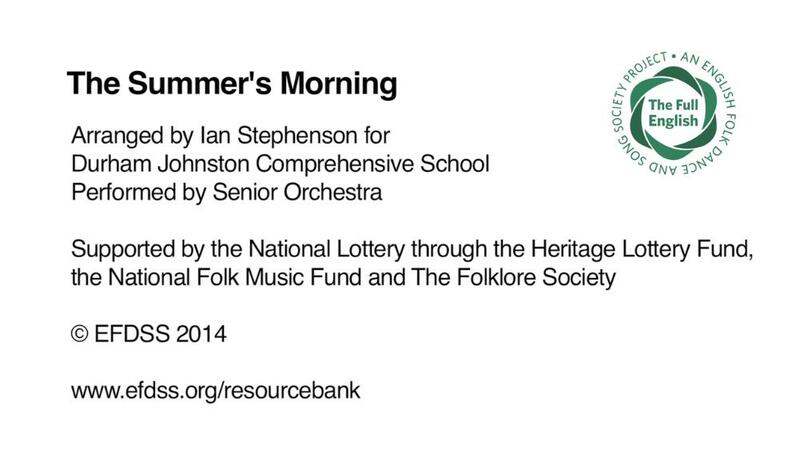 You can download The Summer's Morning score and parts from the PDF tab. Ian Stephenson is a composer and multi-instrumentalist from Selby in North Yorkshire. Since winning the BBC Radio 2 Young Folk Award in 1999 he has become a respected regular at folk festivals around the world, performing with bands such as Kan, 422 and Baltic Crossing. As well as performing internationally, Ian has been a regular tutor at Folkworks Summer Schools for the last 10 years, this year becoming director of the Youth Summer School. Since graduating with a Folk and Traditional music degree in 2005, he now teaches contemporary compositional techniques, instrumental lessons and music skills at Newcastle University. Most recently Ian has been been very productive, having had several commissions to write pieces for choirs, orchestras and Kathryn Tickell's new ensemble The Side. His latest choral piece "On Another's Sorrow" was included as part of BBC Choir of the Year competition 2014.